Cons: Looks can be deceiving - first impressions give an appearance of cheapness, but this is misleading. It's a well thought out lens using modern materials to good effect. Remember to set the lens at the starting position on 35mm and to return it there before shutdown. Pros: Ultra compact size; excellent, sharp optical performance, light weight, easy portability; small 46mm filter size keeps costs down, too; very useful coverage of 70-200mm equivalent in 35mm terms. A 'hard-to-beat' package whichever way you look at it. Summary: A surprise and a gem! Certainly a keeper offering great performance for sensible money. You can buy a higher spec version for a much higher price, but it's questionable how much more is really gained. 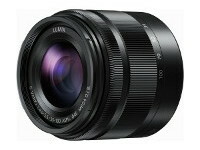 Ideal companion to the Lumix 12-32mm stablemate giving a lot of lens power in a quality duo. Some good price deals on offer in the marketplace add to the attraction.